Indeed, lab experiments into cultural transmission are growing in popularity. I think this is important because these experiments not only add to the insights revealed by mathematical modelling, theoretical literature and real-world data, they also provide alternative explanations for the observed patterns and idiosyncrasies of human behaviour. The current paper provides a nice overview of the literature and methodology used to study “some kind of transmission of information (knowledge or behaviour) along a chain or within a group of more than two participants”. Specifically, they focus on three experimental paradigms: the linear transmission chain, the replacement model and the closed-group method. 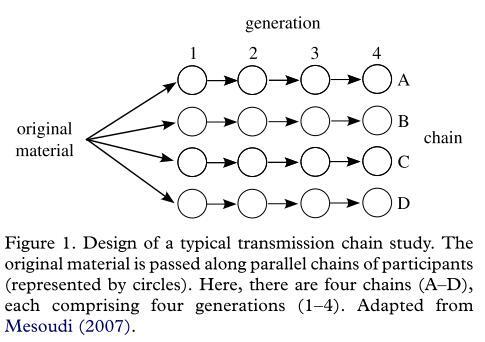 Originally created by Federic Bartlett (1932) to investigate the role of memory, diffusion chains are comparable to the children’s game of Chinese whispers: here, some sort of cultural material (usually a sentence or phrase) is passed along a linear chain of individuals (see figure 1, taken from Mesoudi & Whiten), until it reaches the final person. At this point, the sentence or phrase is normally different to its original incarnation, having accrued errors due to repeated retellings. These early experiments examined a whole host of material: from Native American folktales to descriptions of sporting events. In each of these studies the original material retained its overall meaning once reaching the end of the chain, but through repeated retellings along successive participants, the material also displayed two consistent factors of change: 1) the material became much shorter in length, and 2) the material lost much of its original detail. Bartlett also observed what he believed to be evidence for memory being reconstructive, with cultural material becoming distorted through a process of conforming to pre-existing mental schemas. Recent studies using diffusion chains have further supported Bartlett’s claims of generalisation, whilst also investigating his claims of assimilation, such as pre-existing gender stereotypes and prior cognitive biases. In my own field of evolutionary linguistics, we have combined the diffusion chain methodology with artificial language learning to show that languages, as a consequence of intergenerational transmission, evolve to increase their own ability to be transmitted: by becoming easier to learn and increasingly structured (note: this is for the initial evolution of language (and its underlying structures), and is probably not as relevant to language change). The chains have also been adapted to investigate foraging techniques of chimpanzees and children, the transmission of social learning techniques in chimpanzee tool use, and observing the establishment of a wild-type song culture in zebra finch. […] the broader cultural evolution literature has long recognized that cultural transmission can be imperfect, vulnerable to distortion by content biases, and based on continuous rather than discrete (meme-like) traits (Cavalli-Sforza & Feldman 1981; Boyd & Richerson 1985). Models that make these assumptions are just as useful as models that assume high-fidelity particulate inheritance (Henrich & Boyd 2002). Similarly, while certain patterns of cultural variation might be explained by the operation of cognitive attractors, as argued by Sperber & Hirschfeld (2004), this should not preclude the possibility that cultural variation can be influenced by other cultural transmission biases too (e.g. conformity, see §5), as acknowledged by Claidiere & Sperber (2007). Or perhaps both model-based and content-based biases operate simultaneously but at different levels: for example, content biases might favour the transmission of minimally counter-intuitive concepts in general, but which specific minimally counter-intuitive concept a person adopts is determined by model-based biases such as conformity. Researchers can then examine how group performance changes over successive generations, and how the socialisation of each new participants into the group affects this change… Generally, the replacement method is useful for simulating cultural change that occurs with changing group membership, as is found, for example, in business organizations with frequent staff turnover or traditional hunter-gatherer societies in which small groups maintain stable traditions despite continual population replacement via births, deaths and migration. Cumulative culture is simply the ability to accumulate cultural innovations across successive generations. As such, each new generation benefits from, and subsequently adds upon, the prior generations’ cultural knowledge. This observation is hardly new and is nicely captured by Isaac Newton’s popularisation of the utterance: “If I have seen a little further it is by standing on the shoulders of Giants“. By this, Newton was paying homage to previous generations (or it was a veiled jibe at Hooke) by saying that his particular insights and innovations in physics and mathematics are derived from past thinkers. Without these foundational bricks (such as the ancient Egyptian successes in calculating volumes and areas) it is highly unlikely the development of complex cultural products (such as integral calculus) is possible by a single individual within a single lifetime. In fact, that the fundamental theorem of calculus was independently discovered by Newton and Leibniz suggests the accumulation of knowledge during this time and place had reached a point in which the connection between integration and differentiation was ripe for a genius, or in this case, geniuses, to formulate. […] the voluntaristic groups of traders increased their productivity and earning during successive replacements due to the emergence and intergenerational transmission of increasingly efficient trading tactics (e.g. soft bargaining: giving more than is received) and division of labour (e.g. seniority rules for leadership, where the longest serving member took charge). A more recent study by Caldwell & Millen (2008) used the replacement methods to show how successive groups developed increasingly effective artefacts (paper aeroplanes and spaghetti towers). For instance, paper aeroplanes in later generations flew significantly further than those created by earlier generations. However, a common problem with this, and other studies into cumulative culture, is that they do not control for individual learning. The basis for this control being that it is difficult to conclude whether or not these experiments have demonstrated true cumulative culture: given the same length of time and ability to successively modify their artefact (e.g. paper aeroplane), could an individual have invented a product that performed equally as well (e.g. flew far) as those found in these transmission experiments? Individuals within a group repeatedly engage in a task or game over the course of the experiment, and the experimenter can manipulate the opportunities for cultural transmission (i.e. who can view and copy other participants’ behaviour and when) within the group (figure 3). This method is useful for simulating under controlled conditions the various cultural transmission biases modelled in the cultural evolution literature concerning ‘who’ people copy, such as conformity or prestige bias, as well as testing cultural evolutionary hypotheses regarding the conditions under which cultural transmission is predicted to be employed relative to individual learning (‘when’ questions). There are several advantages to using this method over the other two mentioned. For instance, it is far quicker to complete these experiments than to have to account for the replacement of participants. What’s most relevant, however, is that in contrast to the general body of literature pertaining to the former methods, the closed-group studies are often “explicitly designed to test the assumptions and findings of existing theoretical models of cultural evolution”. 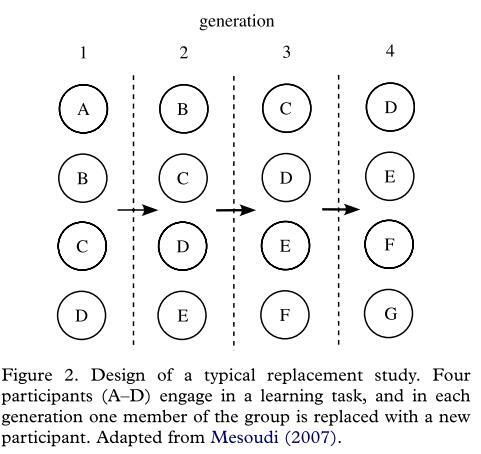 Mesoudi & O’Brien (2008) applied the closed-group method to experimentally simulate the cultural transmission of arrowhead designs. Specifically, they tested a hypothesis put forward by Bettinger & Eerkens (1999) in which the variation of Great Basin projectile points between Nevada and California were the consequence of two different transmission modes — indirect bias and guided variation. Looking at various design features, such as weight, width and length, Bettinger & Eerkens concluded that those points found in eastern California were the products of guided variation, due to the poor correlation between points within the group, whereas those found in central Nevada were subject to indirect bias, given their highly correlated features. In the experiment, participants designed and tested their own virtual arrowheads, with certain types of arrowheads contributing to greater pay-off than others (you can play the game here). Modifying arrowhead designs could be achieved through two methods: either trial-and-error individual learning (guided variation) or by copying the most successful member of the group (indirect bias). Mesoudi & O’Brien found that during individual learning the arrowheads displayed an increasing amount of diversity. Those participants who could copy the most successful individuals eventually ended up with more homogeneous arrowhead designs. But why did the arrowheads in Nevada converge towards a uniform design, in contrast to those found in California? One possible explanation is that the environment in prehistoric Nevada was harsher than the Californian environment. This rests on the assumption that social learning is more successful (adaptive) when individual learning is costly, with the Nevadan environment imposing a greater cost on experimentation, restricting the diversity, and increasing the reliance on indirectly biased cultural transmission. Mesoudi & O’Brien (2008) assumed a multimodal adaptive landscape underlying arrowhead fitness, with multiple locally optimal designs (‘peaks’ in the landscape). Consequently, during periods of individual learning, different participants converged on different peaks in this adaptive landscape, thus maintaining within-group diversity in arrowhead designs. During periods of cultural learning, different participants converged on the high-fitness peak found by the most successful group member, thus reducing diversity and increasing overall group fitness. However, Mesoudi (2008b) showed that when the adaptive landscape is unimodal — with a single peak and a single optimal arrowhead design — then individual learners easily converge on this single peak and perform just as well as the cultural learners, thus eliminating the adaptive advantage of cultural learning. The shape of the fitness landscape, then, is crucial in determining the benefits, and adoption, of a particular cultural learning strategy. For instance, point designs might display functional tradeoffs across a range of factors: accuracy, range, durability, killing power etc. Cheshier & Kelly (2006) examined this problem, and found that “thin, narrow points have greater penetrating power, but wide, thick points create a larger wound that bleeds more easily”. As such, we end up with a situation where there are several, local optimum point designs: one may maximise penetrating power and another maximises bleeding. To solve this problem, arrowhead designs, among many other cultural artefacts, are likely to be compromises between multiple functions and requirements. While mathematical models in the gene-culture coevolution/cultural evolution tradition have produced invaluable insights into the processes of cultural change, laboratory experiments are needed to test the assumptions and findings of these models with actual people. Similarly, while, historical, ethnographic and archaeological studies of cultural evolution… are invaluable in providing real-world data regarding cultural change, laboratory experiments offer a degree of control and manipulation that is is impossible to achieve with naturalistic studies. Of course, laboratory experiments also have their shortcomings, most obviously deficits in external validity resulting from the simple tasks and artificial laboratory settings involved. However, when experiments are used in conjunction with other methods, as part of a unified science of cultural evolution (Mesoudi et al. 2006b), then a better understanding of cultural phenomena can be attained than when a single method is used alone.